TurBARlence serves contemporary Australian food with a focus on local produce. We want to show off all the wonderful local food and beverage producers we can! The dining room is a bright, open-plan space adjacent to our reception. Our large terrace is beautiful on a sunny day, and luckily in Mackay there are a lot of those. You can book your table online now here. Ashleigh completed her chef’s apprenticeship at the Novotel Brighton Le Sands, in Sydney. After moving out to Chinchilla for a stint, she’s been drawn back to the oceanside lifestyle and the draw of passionate local producers. We are so lucky to have her on board as our Head Chef! 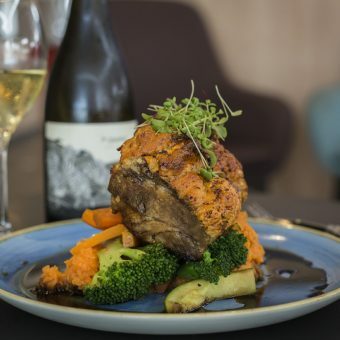 “We want to show people what the Mackay region has to offer through our menu. Each dish has a story behind it of where the ingredients came from – hopefully making your experience more interesting and enjoyable.” Ashleigh Black – Head Chef.